A determined (not to say willful) child, Delilah tells everyone she’s the queen of a faraway land where she makes all the rules. When she goes to the library, however, Library Anne is there with her own rules: no climbing, no running, no singing, and above all, no cupcakes. But in the libraries in her land, Delilah says, running and climbing are allowed, and cupcakes and doughnuts are provided. Clearly, Library Anne doesn’t know the first thing about how to run a library! 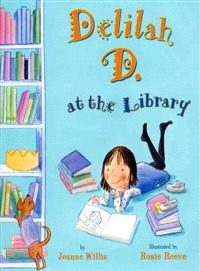 When this lively battle of wills has run its course, Library Anne is dreaming about becoming an astronaut?and Delilah D. has a library book to take home. In her land, of course, everyone reads upside down. With bright, comical illustrations, including open-out gatefold pages, this extra-big picture book will captivate any child who has ever considered breaking the rules.